At the end of the year 2012, the paper "Secure stadium experience" was introduced into German football. While this package of measures is into its second season now, we would like to see how our European neighbours handle the topic of security in football. For the start of this series, we took a look at Austria, Turkey, the Netherlands, Sweden and France. In this text, we set our eyes on how things are in Switzerland. The original article was published on our German site and then translated by Nadja. The situation of footballfans in Switzerland, just as in other countries, is not completely described without including the ice hockey supporters. Not only is it, other than in Germany, normal that almost each football fan is also an ice hockey fan – and the other way round, there is also an almost identical amount of football and hockey fans, causing the same kind of problems. So all sanctions are always meant to be for both groups. You can think of it in that way: some years ago, when FC Lugano still played in the first division, the authorities would consider their game against FC Zurich to be a potential risk game, even though they do not share any rivalry at all. But as the hockey teams ZSC and HC Lugano are arch enemies, it could happen that fans would recognize each other from a hockey fight and that fights between the football fans could emerge. An even more absurd story is told about the derbies in Zurich where one day at the game between Grasshoppers and FC Zurich hooligans would fight each other and the next day in the hockey derby between ZSC and EHC Kloten, the same people that have fought side by side would face each other. If this is really reality or just an urban myth is beyond my knowledge. But these stories and possibilities sure influence the matchplanning and the treatment of football fans. From these first lines already, one can see that there are fights during football games in Switzerland. Even though reality is not as bad as the media like to put it, there’s quite some violent potential among fans of some teams. 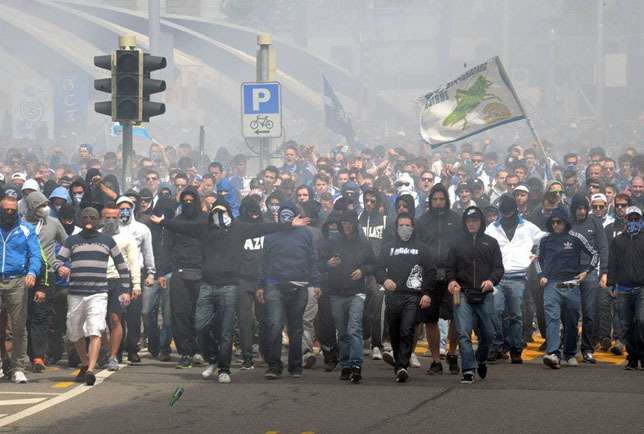 Especially the two teams from Zurich and the FC Basel have big hooligan/ultra groups (often the two are not really separable). Due to the two big rival groups, especially in Zurich fights, pub attacks and similar incidents can happen where also innocent bystanders can be hurt. In the course of the Euro 2008, the treatment of football fans and especially hooligans have been aggravated. The police used to let the hooligan fights go for some minutes in the past, that became unthinkable in the run-up to the European Cup. Even preventive custody has become a possible tool against hooligans if the police thinks that they might be searching for revenge in a certain game. Next to that, there’s the so-called “hooligan concordat” that is implemented in more and more cantons since 2013. It’s including a compulsory permission for all games, which means: each and every game in the Super League (football) and National League A (hockey) needs to be approved by the authorities. Permission can include building constraints, prohibitions, rigid separation between blocks, etc. Further, the permission can also be attached to so-called “combi-tickets”. This means that away fans are forced to travel with the special train, even if this means a huge detour for them. A fan of a club in Geneva, living in Zurich, would have to travel 300km in the wrong direction to see the away game in St. Gall – and travel back to Geneva on the way back. Even though the current practice of special trains works well. The concordat also involves that groups may be searched by private security companies (not only the police!!!) also in genital areas. A ban of alcohol and flags is discussed. The concordat is squishy and unclearly worded. This gives the authorities a huge room for interpretation and can lead to the violation of fundamental rights such as the limitation of the freedom of movement. Separated divisions and rigid admission control were the reason that a test game of FC Zürich against a bush-league opponent had to be closed for public as the city insisted on all above mentioned requirements. Other background information about the concordat can be found here (http://www.tagesanzeiger.ch/dossiers/schweiz/dossier2.html?dossier_id=1884). That the fans are not completely innocent that these kind of measures have to be taken is clear. Especially the firing off of pyrotechnics is widely practiced in Switzerland and often willingly exaggerated. 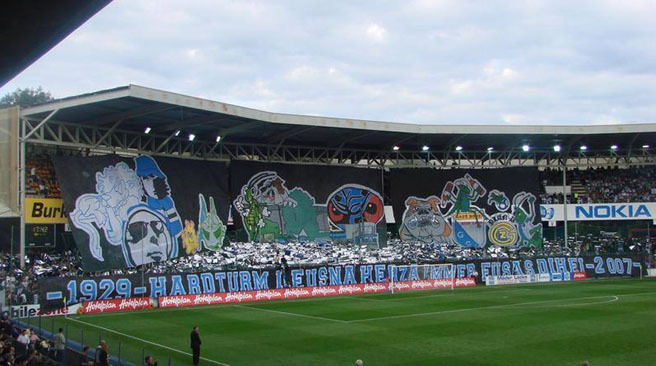 Some may have seen the pictures of the Zurich Derby 2013 (https://www.youtube.com/watch?v=ssKKL8Fyrcc) when GC-fans symbolically burnt down the unloved exile Letzigrund stadium. Even though this was an extreme case and shocked the broad public, the firing off of pyrotechnics is seen a lot more relaxed in Switzerland than in Germany. The police hardly ever intervenes, announcements through the stadium speakers are normal, but (of course) not followed, whole-body searches hardly ever achieved the anticipated result and even though the police knows the people involved because of the small scene, also mummed, not many are sentenced. Furthermore, there have hardly been any dangerous situations or pyrotechnics thrown to people in the past years, despite the excessive usage. Especially in the topic of pyrotechnics it is clear that the fans tend to see the media as the force behind the restrictions. Within the clubs, pyrotechnics is sometimes welcomed, many police agents are open to the topic in personal talks and don’t understand the repressions against pyrotechnics. Nobody can say this in public, however, as he would be in danger of being accused of glorifying violence. Clubs and police are therefore mainly seen as the “executive” that have to implement the measures that were dictated to the authorities by the media. The relation with the police therefore is, despite the occasional violent meetings, relatively relaxed. But fiery situations, many provocations and mutual misunderstandings have let to the term ACAB being widely spread in Switzerland and conflicts with the police happen. Away, the fans are a little more limited as in Germany. Usually, the fans travel in special trains, because the SBB (Swiss Federal Railways) offers cheaper tickets together with the fan clubs or the clubs themselves. Fans can travel for €36 or €54, depending on the distance (as a comparison: a normal train ticket Zurich – Bern, 100km, costs €80, a ticket Zurich – Geneva, 300km, €138). When leaving the train, the fans are welcomed by huge groups of police agents and led through fenced-off passages. At the entrance, the away supporters are thoroughly searched (not comparable to Germany), a drinking ban in the guest stand is common, a 30minute block of the stand after the game is normal. Afterwards, the fans are received by the police again and led back to the train. When people with a stadium ban travel to the away games, they are “parked” at the back of the stadium, freely moving in the city is almost impossible, also for fans without a stadium ban. Who does it anyway risks to be taken along by the police. For smaller clubs, games with less away fans and especially in older stadiums, the measures are less rigid. Fans are only held back in the stands after the game in modern stadiums, for example. Also the ban of alcohol can vary depending on the evaluation of risk. There is the possibility in games that are not classified as risk games to serve alcohol or light beer in the guest stand. In high risk games such as the Derby in Zurich on the other hand there’s an alcohol ban in a wider range around the stadium. Also the journey to the games is not always equally strict. 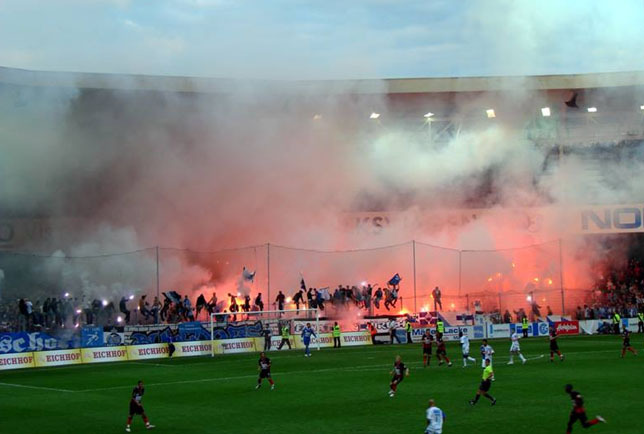 In games between the three biggest “risk clubs” FC Zurich, Grasshoppers and FC Basel, that are all three also enemies, the paths are very limited and fights are often relocated to the city centre and often only happen hours after the final whistle. Instead, the freedom of movement for the regular spectators is restricted. All together, Switzerland is a good example that all the measures, many of them also discussed in Germany, are of little avail and usually affect the wrong people.